No, it’s not 1960. So, why the hell am I calling paper a “killer app”? I mean, this is a technology that first came into being in 200AD. That’s almost as old as the Nokia 3310. Whilst old-hat, Paper can be a more potent tool for productivity than a computer or a touch device, and shouldn’t immediately be dismissed. Not convinced? Here are six reasons why paper is still relevant. I was at a local technology event, speaking to the founder of a technology startup. The night was approaching its conclusion, and we still hadn’t finished our conversation. It was decided to table our conversation for another day, and to swap e-mail addresses so that we could arrange to go for a drink later in the week. I reached into my pocket and pulled out my trusty (and beloved) Blackberry Q10. After mistyping my device password twice, I eventually managed to log in, load up the contacts app and thumb in the email address. Two minutes later, my phone was back in my pocket. Mission accomplished. Him? He reached out into his bag, took out a pad of paper and a pen, and wrote down my email address. Guess which one took longer? Yep. You guessed it. Not paper. Sometimes the technological solution isn’t the quickest or most elegant solution. Crazy, right? Creating wireframes, preliminary designs and database diagrams on a computer is easy. Just kidding. It’s a living hell. I mean, have you ever tried to design a database with all of its cardinalities and relationships with Dia A Free Open Source Alternative to Microsoft Visio A Free Open Source Alternative to Microsoft Visio Need to create diagrams, flowcharts, circuits, or other kinds of entity-relationship models? Microsoft Visio is the best software for that, but it's expensive. We will show you two free open source alternatives. Read More ? Horrid. It’s just an accepted fact that the mouse isn’t a precise instrument in the way pen and paper is. There just isn’t the same degree of fine control when you have a pen gripped between forefinger and thumb. You know what isn’t horrid? Pen and paper. You don’t need to mess with moving your mouse pixel by pixel. Sure, you could get a graphics tablet, but that’s expensive. There’s a degree of craftsmanship with pen and paper that doesn’t really exist in the digital realm. Which is why paper reigns supreme here. When I wrote the previous point, I had Firefox running in the background with ten tabs open. Then I heard the all-familiar ‘pling’ of Facebook letting me know someone had sent me a message. Then I looked at my timeline and saw an interesting article someone had posted from The New York Times. Then I forgot about the piece I was writing and checked Reddit to see if anything interesting had hit the front page. Thirty minutes after checking Facebook, I finished that section. The reality is, we live in a world where being distracted is the default. Focus is a thing of the past, as demonstrated by the ocean of apps and websites helping us focus TimeWarp Redirects Distractions, Keeping You Focused [Chrome] TimeWarp Redirects Distractions, Keeping You Focused [Chrome] Automatically teleport yourself to a productive site every time you try to visit a site you know you shouldn't. TimeWarp may be simple, but it's effective at reminding you to stop procrastinating – sometimes so... Read More and keeping us attentive and diligent. But in the world of pen-and-paper, there’s nothing really to distract you. No cute, captioned cat pictures. No Upworthy. Not even an outstandingly awesome technology blog (ahem). Just you, and the page. Momentum. You get it in buckets. Have you ever been ‘in the zone’? You’re unstoppable. Words flow from your hands to the page with the sheer force and determination of a salmon heading upstream. And then Windows tells you that there’s a new update to install and it’s going to restart in 10 minutes time, but not before Clippy shows up and asks if you need a hand. And then someone sends you an IM. The momentum dissipates. You spend the next hour staring hazily into your screen, wondering what went wrong. You write 10 words, and you feel as though you’ve written 1000. Sounds familiar? The great thing about using pen and paper is that when you get focused, it’s hard to lose it. There’s nothing to distract you, except yourself. You write and write, until you can’t write any more. Bliss. You Can Write Whenever, Wherever. I’m not happy if I’m not traveling. Seriously. I live to be cramped onto a Ryanair flight, breathing recycled air, drinking £5 mini cans of Pepsi and fighting with whoever is sitting next to me for control of the arm-rest. What I don’t enjoy is having to turn off my laptop and stow it away for no apparent reason at the start of a flight. No, I don’t. Moreover, very few airlines come with power sockets. Certainly not the budget airlines that are the mainstay of European travel. You know what doesn’t require batteries and can be used during landing and take-off? You guessed it. Paper. You can work, and you can do so without being disturbed by the landing and take-off. When was the last time you wrote something? I mean pen-on-paper, old-school handwriting. Have you ever thought about how you focused on the page, watching each stroke of the pen combining with others to form words and meaning. Just think about that motion. Just think about the connection between your mind and the page, and how you’re focused on what you write. Recent data support the idea that movements play a crucial role in letter representation and suggest that handwriting knowledge contributes to visual recognition of letters. If so, using different motor activities while subjects are learning to write should affect their subsequent recognition performances. In order to test this hypothesis, we trained adult participants to write new characters either by copying them or by typing them on a keyboard. After three weeks of training we ran a series of tests requiring visual processing of the characters’ orientation. Tests were ran immediately, one week after, and three weeks after the end of the training period. Results showed that when the characters had been learned by typing, they were more frequently confused with their mirror images than when they had been written by hand. This handwriting advantage did not appear immediately, but mostly three weeks after the end of the training. Our results therefore suggest that the stability of the characters’ representation in memory depends on the nature of the motor activity produced during learning. 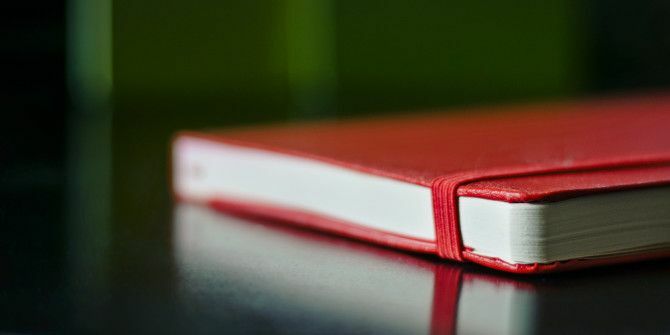 If you’re trying to remember the finer-points of a university lecture, or just what you need to buy from the supermarket, you’ll do well to skip typing it up, and just write it down in a notebook. More focused. More productive. More retention. The benefits of paper speak for themselves. Do they make up for the downsides, such as a slower writing speed and inconsistent legibility? That’s for you to decide. Let me know what you think in the comments below. I've given a lot of thought to this issue. My "only" pen is a fountain pen; I've PRACTISED to have good cursive. I'm passionate about handwriting. I wholeheartedly agree with the article about the benefits of pen&paper: cognition, learning, the pleasant feeling of writing, the sense of accomplishment afterwards, etc. However, the major drawback that ultimately makes technology necessary, is sustainability. Paper and ink are extremely polluting to produce and are just as toxic as waste, what's more prolific writers hove to buy storage space for their books, manuscripts, journals...texts that perhaps will never be consulted again! Why the waste? In fact, if you think about it, literature is by nature transient, virtual: it's only natural that we consecrate it to a virtual medium. I have an iPad that I stripped down, don't have notifying me of anything: it's my notebook and e-book reader. It's better than a laptop because it's closer at hand and won't distaract me. My notes (Evernote) are indexed, easy to read and oh-so-easy to retrieve--no rummaging through a dusty box in a corner of my basement for "that journal"! I'm an idealist, I'd love to write an academic paper by hand one day! But realistically, literature is indexed, searched in databases, downloaded, referenced. The virtual format--digital or otherwise--is the better for exchange of ideas. the ideal is and will always be the written--or in fact the spoken aloud--but the digital is sustainable, efficient and retrievable. And a note on travel and handwriting--ever tried handwriting on a bus? A tablet makes for faster results, that are also indeed legible later. I returned to using paper around four years ago. I use it for my daily calendar, my bullet task journal, writing journals and brainstorming for writing. I still use the computer, but I like the portability and stability that paper gives to these particular tasks. Lately, I've been noticing that the idea of going back to paper is catching on. Most people I see at the local coffeehouse have a paper notebook along side their laptops and phones. Many are only bringing notebooks and pens. Personally, I think it is high time. Paper has been a part of human society for thousands of years. I do not believe that it would be wise to abandon it completely. Whenever I'm struggling to write something, I turn to pen and paper. I find that it frees my mind up a bit. Computers can feel very restrictive; no idea why. And if there's anything really really important, I'll always draft it out in a notepad first. The only issue is when there's a word count to adhere to, in which case you simply have to take an educated guess then edit when turning to the keyboard! Thanks man. Much appreciated. :) And yeah, I get what you mean, exactly. I've found that it's often far, far easier to formulate ideas on paper. Do you have a preferred notepad to use? I use any scrap of paper that's lying around, as well as numerous notebooks scattered at work, in the car, and all around the house. Lately, I've been tidying up the boxes (and I mean large crates) of scribblings, and have discovered numerous poems and fragments of stories I don't have any knowledge of writing. Online, I would doubt, but on paper - well, they're in my handwriting and (considering) that's the only proof needed! Ooooof, I imagine that's hard to collate and manage! Speaking of poetry, is it just me or is it easier to write on paper? Like, I've never written a poem on a computer. Ever. I just find it to be... Really quite hard! Pluses and minuses for both modes, but bear in mind, I spend more "spare" time in the stationery store than in the tech shop. Good job! Great article. Thanks! Aye. And there's something incredibly awesome about having a really fancy pen and notebook. I have a portable whiteboard that I use for brainstorming, visualizing my thoughts, etc. As much as I love to use the computer for things, there are just some things that weren't meant to be done on a computer. Even a tablet-and-stylus often falls short. It's about the size of a regular sheet of paper, so it's not as portable as a moleskin or phone. I mostly use it at home. It's nice for jotting notes regardless of which room I'm in. Nothing replicates doodling on paper. It just does something to your brain. Future generations will miss the fun of doodling on the backpages of notebooks while sitting in the backbenches of a class. Aye, yes they will. Speaking of doodling in class, ask me about the 'Book o' Mario' when you get a chance! I have repurposed an old laptop to SOLELY run work software. It runs the software slightly slower than my desktop, which is expected, as the device is 6 yrs old. However, the "bare bones" mentality behind this repurposing is that I do digital work, with zero digital distractions; I don't even connect it to the internet. It doesn't have any browser. this way i get all the advantages of technology with zero distractions. its all about discipline. Is it? A lot of what I talked about was the practical advantages of using paper (being able to work on a plane/without power) and the cognitive pluses of the medium. Sometimes it's the best strategy! Bullet Journal method used with a grid Moleskine to manage ToDo stuff. A ruled Moleskine for my journaling. Important stuff scanned to Evernote. I hand write proper letters to my Mum often. It's always nice to receive hand written correspondence . You're the second person to recommend the Bullet Journal method. I'm not a grid Moleskine fan though. I prefer the lined one. Cory, I will never use Moelskine again after finding 'Ecosystem' notebooks. Cheaper, recycled, Plus they're made in the USA. I recently switched back to paper, which is a big deal for me being such a tech evangelist. I prefer the process, and It really does help humans remember things. There is something about writing that hardwires info to our brains. Alas, it's hard to get my hands on an Ecosystem notebook in Europe. You're right though. I've heard some pretty amazing things about them. Moleskine FTW! I never leave home without mine. I use the Bullet Journal method, myself (Google it--it's awesome). Cory! You have inspired a new article. You rock. Yes. You do. Great article. I couldn't agree more. I never leave home without a small notebook and pen. Last Sunday I sat in the garden of my favorite pub planning out my articles for the week on paper. It's pretty unbeatable as a medium for brainstorming ideas.